It looks like a lot of runaway races are at lower point limits. At higher values the other ships have the upgrades to keep up. Also, turrets really punish people flying ships without at least 5 hull/shield. Played 2 rounds tonight. EU duchess is no longer allowed. I'll post some pics tomorrow. What point limit were you playing with. I've found lower point totals keep it more fair but it's all about balance. 35 and it was a blow out. I usually try to run balanced 20pt races. If Duchess gets the lead and you can't kill her in a round or so you'll never get back in range. It was nuts. How was it worse than a fully loaded Fel? Both can push ahead 8 in a turn. Was it the extra hull point? It's not full out speed that counts. The ability to do a 5 bank or snake twice is powerful in any track. I think the track we used was part of the problem. PS 10 double (or triple) reposition is really hard to block. She probably won't fair as well Vs. More ships but definitely keeping an eye on her. I think I've finally settled on my items... at least this is what I plan on trying this week. Green Shell (1, 1, 2, 2) - Action: Place the 5 ^ template in your front or rear guides. If the template touches a ship first, that ship suffers two damage; or if the template touches a hazard first, remove the hazard. Discard this card. Between the common green, red, and bananas, this one lets you shoot forward or back because of the limited attack profile. Triple Green Shells (1, 2) - Action: Place this card near your pilot card with three tracking tokens on it. When you are attacked, you may remove a tracking token to re-roll up to two defense dice. You gain, Action: Remove a tracking token from this card and place the 5 ^ template in your front or rear guides. If the template touches a ship first, that ship suffers two damage; or if the template touches a hazard first, remove the hazard. Discard this card. Red Shell (2, 2, 3, 3) - Action: The closest enemy ship in your primary firing arc suffers two damage. Discard this card. Between the common green, red, and bananas, this one lets you shoot forward only. Triple Red Shells (2, 3) - Action: Place this card near your pilot card with three tracking tokens on it. When you are attacked, you may remove a tracking token to re-roll up to two defense dice. You gain, Action: Remove a tracking token from this card and the closest enemy ship in your primary firing arc suffers two damage. When there are no tracking tokens on this card, discard it. Fire Flower (2) - At the start of the planning phase, you may place this card near your pilot card. Until the end of the activation phase, each enemy ship that ends its maneuver at range 1 of you suffers one damage. Discard this card at the end of the activation phase. Decided on pre-planning to add some variety to card timing, plus you could potentially make opponents second-guess maneuvers. Blue Shell (3) - Action: Place this card near your pilot card with two tracking tokens on it. At the end of the activation phase, remove a tracking token from this card. When there are no tracking tokens on this card, discard it and the lead ship receives two ion tokens and one face-up damage card. Rather than an immediate effect, I wanted to play mind games with first and second place, give them time to fight over who gets blasted. Boomerang Flower (2) - Action: Choose up to three enemy ships at range 1-2. Each of those ships suffers one damage. Discard this card. Banana (1, 1, 2, 2) - Action: Drop a Banana token (Escape Pod token). Discard this card. When a ship or its template overlaps this token, remove it and that ship receives two ion tokens. Between the common green, red, and bananas, this one lets you shoot backward only. Triple Bananas (1, 2) - Action: Drop three Bananas (Container tokens) using the 1 ^ template between each. Discard this card. When a ship or its template overlaps one of these tokens, remove it and that ship receives two ion tokens. Bananas and Bob-omb give you a use for scenario tokens! Bob-omb (2) - Action: Drop a Bob-omb token ("Satellite" token - the one with guides, not the tiny ones) from either your front or rear guide, using any 1-, 2-, or 3-speed template. Discard this card. When the Bob-omb explodes at the end of the activation phase, remove it and each ship at range 1 is dealt one face-up damage card. Mushroom (1, 1, 2, 2) - Action: Perform a free Boost action using any 1- or 2-speed template. Discard this card. Triple Mushrooms (2, 3) - Before using this card's action for the first time, place it near your pilot card with three tracking tokens on it. Action: Remove a tracking token from this card and perform a free Boost action using any 1- or 2-speed template. When there are no tracking tokens on this card, discard it. Golden Mushroom (3) - Play this card when you reveal your maneuver dial. Instead of performing the revealed maneuver, you may perform a number of consecutive white 1-speed maneuvers of any bearing equal to the speed of the maneuver you revealed. Discard this card. Reveal your fastest maneuver and do crazy stunts; one thing I'll be looking out for is whether or not mushrooms and the like should disallow hard turns, which may be balancing as well as thematic to Mario Kart. Star (1, 2) - Play this when you reveal your maneuver dial. This turn, you may ignore all hazards and enemy ships, and cannot take any damage. After executing your maneuver, you may perform a free Boost action using any 1- or 2-speed template. Discard this card at the end of the turn. Blooper (3) - Play this card before the planning phase. This turn, instead of setting their own maneuver dial, each other player ahead of you passes their dial face-down to the player to their left and that player chooses their maneuver at random. Discard this card. Lightning (3) - Action: Each enemy ship ahead of you receives two ion tokens. Discard this card. Bullet Bill (3) - Play this card when you reveal your maneuver dial. Instead of performing the revealed maneuver, you may perform a white maneuver using any template. If you or your template would overlap a ship, you must first assign that ship a tractor beam token, then complete your maneuver. Discard this card. Piranha Plant (2) - Action: Perform a white 1-speed maneuver of any bearing. If you overlap a hazard, remove it instead of applying its effects. If you overlap an enemy ship, you take no damage from the collision and may discard one of that player's cards. I felt like losing a card was enough punishment without stealing it, plus a few cards let you remove hazards which could come in handy. Super Horn (2) - Action: Assign a tractor beam token to each enemy ship at range 1. Discard each hazard at range 1. Discard this card. Or discard this card at any time to cancel the effects of any Shell card that would affect you, or any Shell card near the pilot card of any ship at range 1; discard that card. How wide is your track? Do you allow large base ships? We run 15cm for the track and allow big ships. A contracted scout moving first is tough to get around. Also, consider putting fewer checkpoints. This helps the runaway leader respawn farther back. Awesome cards! I like the removing hazard options with the shells. I also like Boomerang flower. I might do something similar, but use 3 hard turn in the front guides so It's a curved path. On fire flower and blooper maybe play them at the End phase and they take effect next round rather than Pre-planning. Bom-omb, if its dropped as an action then it would also affect the ship that dropped it, unless the 3 straight is used. Perhaps drop it before you reveal your dial or clarify as all other ships. Thanks. End phase is right before pre-planning the next round, so that shouldn't make a difference. Bob-omb probably will need a tweak, not sure what, but I do want it to be one that can be used forward or backward. A 3 forward is just outside of range 1 of yourself if that helps. Not very wide. Probably designing a new one tonight. We haven't done big ships mostly because of that size (and we've done low point costs to keep it simple). We also noticed that the figure 8 isn't condusive to getting lots of shots on leader as when you get just far enough ahead your opponents are coming around the top or bottom and facing at 90 for you. The snakey-er track provides more firing points. Yes, a snakey-er track gives you the extra shots. I can't argue enough for large base ships. Strategic bumping (rubbing is racing) can really put a hurt on an agile ship. How bad to collisions with the walls hurt the ships? Walls are auto damage. Bumps are roll a red and suffer result. I'm working up a track with double sheets of paper. Pretty epic sized. Should fit big ships easily. Snakey as all get out. Ah. We don't use bump damage. Just the usual loss of action. Our walls are two layers. The first cm acts like an asteroid. The second line is impassable and does auto damage and bumps you back 2. Here is a shot of the larger map we used to use. Plenty of twists, but too long for a race. Talking about track size...if you go really narrow, it can be quite nasty. J-bot had some short cuts that were only a large base wide. So...not only can you only fit one ship in them, but if you don't line up exactly, you are going to be bumping. It's too narrow to Boost or Barrel Roll at all. You can't even do a 1 bank without hitting a wall. It's pretty nasty. How did the shortcuts work in the context of providing a catch-up feature? The biggest problem any racing game has is a runaway leader. Electronic versions have a "rubber-band AI" that keeps them close. I think the problem to fix is how to keep the race competative. We still don't have a problem with the Striker running away, and a big part of that is blocking as a strategy and having a narrow track that makes it hard to effectively chain the adaptive aileron moves. I am all in favor of letting the track design be the restriction instead of a banlist and point limitations. Years ago Popular Science published an article about how track design can be used to control a stock car race. It advocated no limitations to car design, but let the track provide the limits you want. If you don't want giant cars, put narrow areas in the course. If the speeds are too high, bank the corners out instead of in, etc. Phone won't let me link to it, but it is the September 2004 issue of Popular Science. The short cuts did cut out some time rather then going around. It was usually safer to move around the corners. You also got the boxes by going around the long way. If you cut corners, you faced the turrets and had to get it just right. It was risk vs reward. Overall, I found the cards make the best chance to keep the race competitive. I have what I put in my decks earlier. There are other versions. I worry about giving the lead ship too nice a box card. Also note, the red shell has no range limits. I was able to hit a ship on the far side of the board! This hits on us playing by different rules. We keep the race competitive by limiting checkpoints, providing firing lines, and narrowing the course. Like you said, the cards keep things in check, but if they are too powerful the game is roulette, not a race. What is the largest point build you use? It's really tight balance. I think # of ships are an issue too. 3-4 and it seems like someone can always sneak out front and just stay lucky. 5 seems to keep it tight but takes FOR.EV.ER. We either use 24 pts or Z-95's with 5 points to spend on anything, except 0 pt EPTs. You can even take as many EPTs as you want for 5 pts. Number of players is important. I go with 4-5. There's an MK tournament this weekend. I was really hype for it. Sad. Sounds like a blast. How many players per "heat"? How long do games last for everyone else, by the way? 2. Re-spawning returns your ship to play with full shields, 1 ion token and no damage, but does not return spent ordinance. Spent ordinance is only regenerated after each lap. If during a bump one of the ships is destroyed the surviving ship can take their action if able. I.e, I move, bump another ship and then they are destroyed I then get my action since the ship is no longer in my way. 4. Each player chooses 2 hazards (asteroids, debris, bombs, ion clouds etc) to place before the race. No hazards can be placed before the first checkpoint. All standard rules apply to the hazards regarding game effects. 1. Crates are refreshed at the start of the activation phase. When a ships movement or base overlaps a crate they pick up a card from the pile. If a crate regens under a player they still get a new card. 2. If you already have a card you must discard it and pick up a new card (this prevents people from sitting on the good cards). 3. Once all cards have been picked up, shuffle the discard pile and use again. 4. Card actions/attacks when used take effect immediately. For example the first ship to move uses the lighting card; all ships take the ion damage at that time. 7. Treat all walls using the Overlapping ship rules. I.e. if you Bump the wall, move the ship back along its manoeuvre template. 8. Turrets shoot at everybody in range, not just the frontrunner. Turrets roll 4 attack die + range bonus. Ships roll defence dice and can use tokens. Turrets shoot first in the combat phase. 9. Shooting across the track edge adds 1 green dice for the defender. 10. 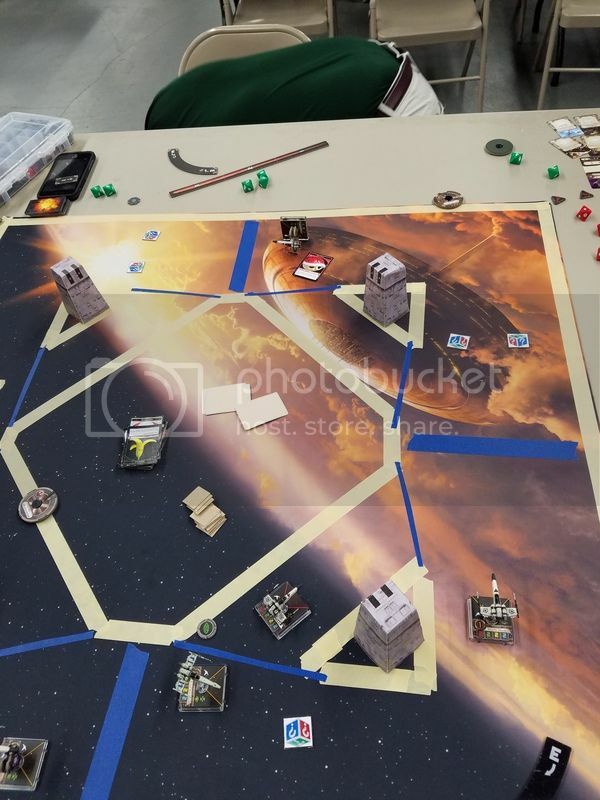 Deployment will take place behind the marked start line and will start with the ships with the fewest number of points, ties will be broken by pilot skill with lower PS placing first, further ties will be determined by dice roll. 11. Activation and combat phases use standard pilot skill rules. 13. During the Combat phase, damage cards are dealt face down. Once your ship is destroyed follow the re-spawning rules above. My thoughts on this are it negates the crits that would have no effect at this level - no damage cards needed so can be marked with tokens etc, the Ion fits more with the Mario Kart theme of respawning and not doing much then getting back up to speed following it. the mystery crates idea would still need some printed stuff but not much, could even replace the Turrets and line up a Raider and Cr90 side by side through the middle and have the track going through the crossfire. So, now that Scum has an EPIC ship announced, some of my friends thought it would be funny and fun, to run a Mario Kart race with EPIC ships. I have multiple's of all of them, and will buy multiples of the C-ROC. So, how big do you think a race track will have to be (especially in terms of WIDTH for the corridors) to actually make this feasible? I am thinking that it is going to have to be ONE HELL of a huge track. I also think it will be funnier than *&^% ! Hiya! There are a few things to consider and I have some questions. What happens if you are blown up? I saw the rules about going off the board respawns you and ionized. Is it the same for blowing up? It's an idea I was thinking of. You would have to have them ionized at least for a round. Or are you still doing the check point? I do like the no crit aspect. Makes it easier. How many players per table? We found the more players on a table means the more total destruction. Less focus on racing. We prefer 4 on a table, but no more than 6. I would recommend running more than one table and then making it a series. So....swap people around and put them on a different race track. It would keep it more interesting for people if they try out different tracks. Maybe hold 3 races? Personally, I like the more Mario Kart cards instead of X-wing upgrades. To me, the idea of the upgrades are to really make it like Mario Kart and to also help even things out when someone gets too behind or ahead. With that in mind, I have a strong opinion on having 3 decks for first place, middle, and last. I think if you get really far behind, then there is absolutely no chance of you even catching back up with the pack if you don't have some crazy card. Or....the leader can break away and hold on to some card like Blue Shell in his hands. Or the leader gets a really good card that lets him get even further in the lead. I know there was another set of the 3 decks, but I (of course) prefer the one I came up with. The leader deck has fewer amazing cards and I think it should be kept that way. I'm almost thinking of adding in better cards for the last place guy. You might want to think about banning Tie Striker with Ailerons and Engine Upgrade. It's...pretty effective. We also said no Cloaking at all, either. I know you can't get a Phantom, but I think you can also get the Illicit in there. I'd ban that. You might want to have different types of races. I know J-bot has done "stock car races", which has everyone take a Z-95 with 5 pts of upgrades. You can take numerous EPTs, but no zero point ones. This can take the racing away from the ship and more on the driver/pilot. You can also have a higher point limit, if you want. If you have 3 types of races, you can just rotate each group on the tracks. For starting spots, we marked 4 spots on the map and let the person with highest PS pick their spot. Then the next, etc. It let those who wanted to be in rear or in front pick what they wanted (if they had the PS) instead of forcing all one way or the other.